Hike a six mile loop to Georgia’s highest Appalachian Trail summit, climbing the AT and Byron Reece Trails to beautiful views at the Blood Mountain summit before looping back through a fern-filled forest on the Freeman Trail. The Blood Mountain summit is one of Georgia’s most popular hiking destinations, and for a good reason: the views from the summit are lofty and stunning. Rising high over the surrounding southern Appalachians, the legendary mountain towers above the surrounding peaks, climbing to 4459 feet. The mountain is the highest point of the Appalachian Trail in Georgia, and home to a historic stone AT shelter at its summit. 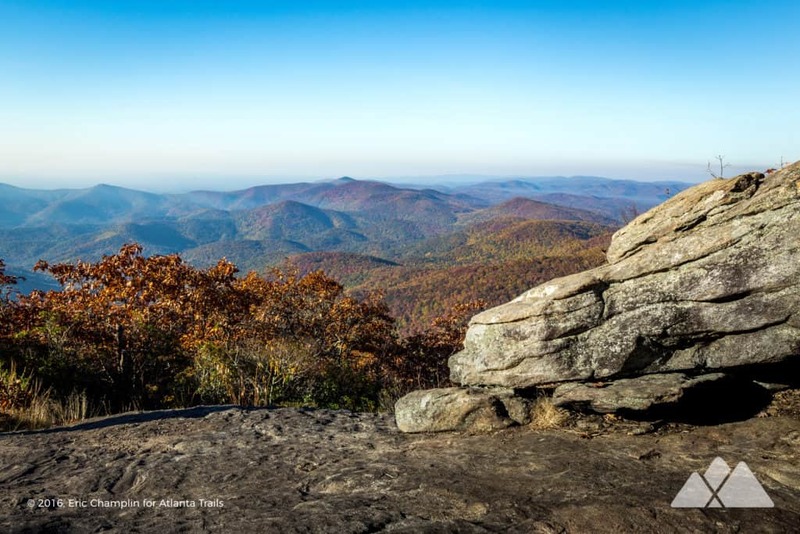 While the out-and-back hike on the Appalachian Trail to Blood Mountain is most popular ascent route to the summit, this hike explores some of the mountain’s quieter stretches on a scenic six-mile loop. From the Neels Gap trailhead, the loop hikes the mountain’s eastern elevations on the Byron Reece Trail, climbing from a mossy, fern-filled stream valley to the Appalachian Trail. The hike climbs to the mountain’s summit on the AT, scaling broad rock outcrops and catching near-summit views. From the summit, the hike grabs some solitude on the mountain’s lesser-traveled western slope and then turns to loop through a beautiful, boulder-filled forest on the Freeman Trail. The hike departs from Neels Gap on the Byron Reece Trail (view maps and driving directions), hiking southwest and following blue trail blazes through a cool, mossy stream valley filled with rhododendron and fern. The trail gains elevation steadily under a young forest canopy as it approaches the Appalachian Trail, carving through several sharp switchbacks as it climbs. The Byron Reece Trail reaches the Appalachian Trail at .7 miles at Flatrock Gap. This route turns right at the trail intersection, following the Appalachian Trail’s rectangular white blazes westbound to the summit. 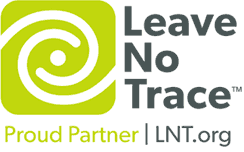 (A left turn at Flatrock Gap follows the AT eastbound, climbing to the scenic peaks of Cowrock Mountain and Wolf Laurel Top on the Appalachian Trail. It’s a fantastic 13-mile adventure, and a great backpacking trip, too. The hike rapidly gains elevation as the AT crosses a series of vast, expansive rock outcrops and carves through a number of switchbacks. Views extend on the left from the outcrops, offering increasingly beautiful views of the surrounding hardwood-covered summits of the Chattahoochee National Forest. The elevation gain intensifies as the hike meets a series of tight switchbacks, scrambling over boulders and climbing rock stairs at 1.1 miles. The trail reaches a clearing at 1.6 miles, and the tree canopy opens to reveal a generous vista of Georgia’s southern Appalachian mountains. Views are especially beautiful in fall when the forest’s hardwood trees explode in a colorful array of color. The hike dives through a canopy of mountain laurel and pine, nearing the summit. Vibrant green mosses and steel-blue lichen thrive on the high-elevation rock outcrops near the mountain’s peak. 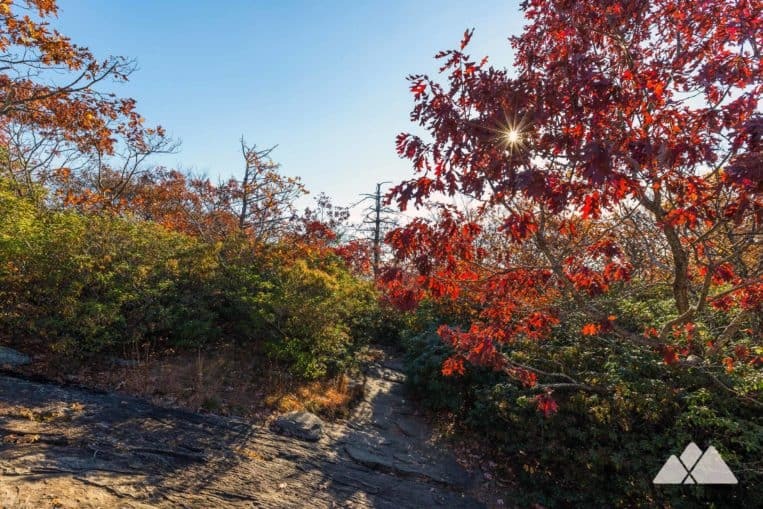 At 2.15 miles, the hike reaches the Blood Mountain summit, where a massive rock outcrop offers outstanding, sweeping views from its jagged brink. Alongside the summit, a historic, stacked-stone AT shelter offers rustic accommodations for thru-hikers on their epic, 2000+ mile journey from Georgia’s Springer Mountain to Mount Katahdin in Maine. Departing the summit, the hike continues following the Appalachian Trail northwest, following the AT’s white rectangular blazes. The hike drops elevation, diving through a dense tunnel of gnarly, twisted rhododendron and passing massive, gray boulders covered in lichen and moss. 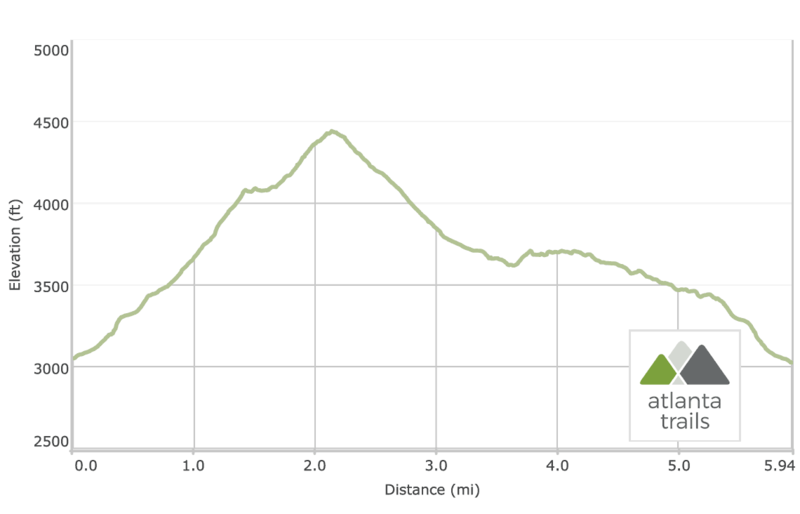 The hike follows the AT through a series of switchbacks at 2.3 miles, rapidly dropping elevation. The trail meets the junction with the Duncan Ridge Trail at 2.6 miles. 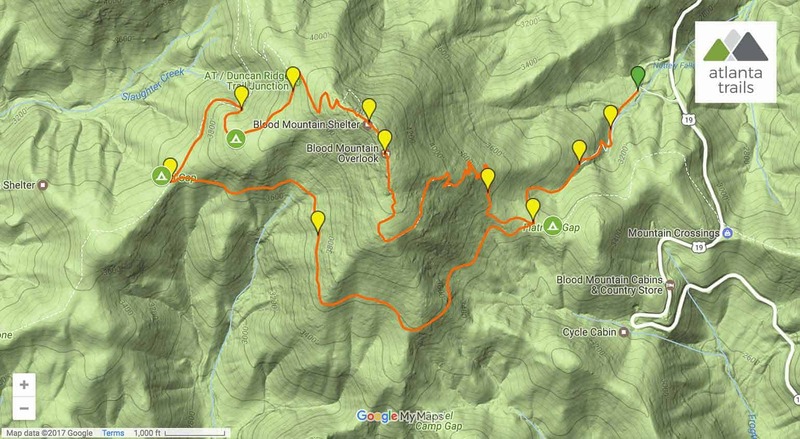 (The Duncan Ridge Trail descends to Vogel State Park via the Coosa Backcountry Loop and Bear Hair Gap Trail – our favorite alternate route to the mountain’s summit when the Neels Gap parking area is full.) The hike passes a blue-blazed side loop trail leading to campsites before passing a junction with the Slaughter Creek Trail, which leads to Lake Winfield Scott, at 3.05 miles. The hike begins to level as it trails through a mixed pine and deciduous forest, reaching an intersection with the Freeman Trail at 3.5 miles. This route turns left on the Freeman Trail, hiking eastbound in a wide arc around the mountain’s southern slope. The trail crosses through alternating stretches of boulder fields and grassy, wildflower-covered clearings, and makes some difficult scrambles over the mountain’s rugged terrain. Ferns thrive here on the mountain’s southern elevations, shaded by the dense forest canopy. 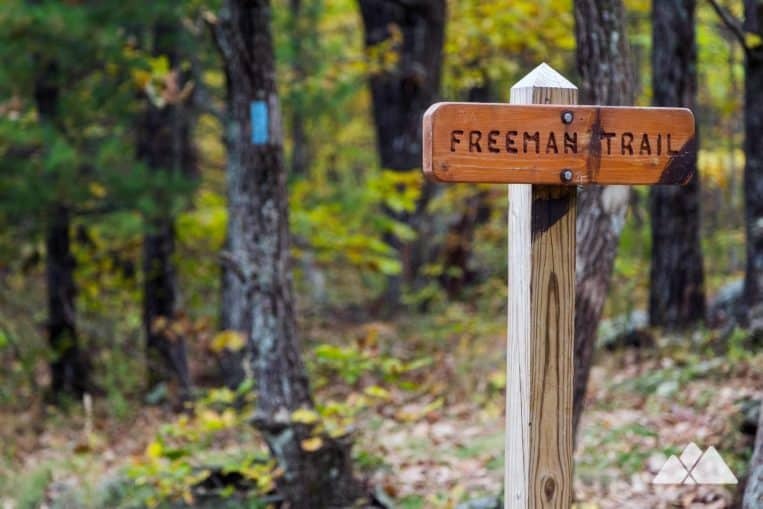 The Freeman Trail meets the Appalachian Trail and Byron Reece Trail intersection at 5.25 miles. The hike returns to the trailhead via the Byron Reece Trail, dropping elevation through the rhododendron and boulder-filled creek valley. Reaching the trailhead, the adventure completes at 6 miles. Have some energy left to burn? Hike to two beautiful waterfalls at Desoto Falls just south of Blood Mountain, a relatively short and easy two-mile hike. Follow the Bear Hair Gap Trail from Vogel State Park, looping through a lush forest filled with small, tumbling waterfalls and climbing to a beautiful view from an overlook. 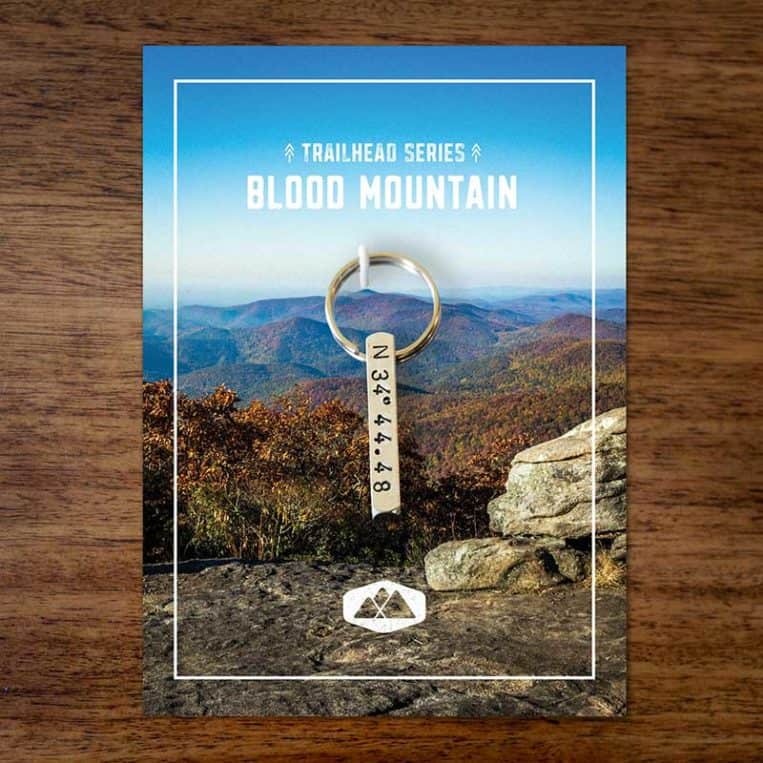 Or check out our Blood Mountain trail and camping guide for more adventure inspiration in this beautiful, rugged wilderness. Free (limited) parking is available at the Byron Reece trailhead at Neels Gap.